Like many kids growing up in the 1980s, I was terrified by the prospect of a nuclear war. But I also became fascinated by what would come after, in spite of the grim picture conjured up by the TV movie The Day After, the book The Fate of the Earth or the many other post-apocalyptic visions I have consumed right up through today (On the Beach, 28 Days Later, The Pesthouse). And this month we have the film adaptation of Cormac McCarthy's The Road, about a father and son's quest for safe haven after an unspecified global disaster. These works have survivors battle against mutants, disease or other survivors, and have more to do metaphorically with legacy or redemption, or literally with the effects of nuclear war, than they do with my true interest: absolute solitude. 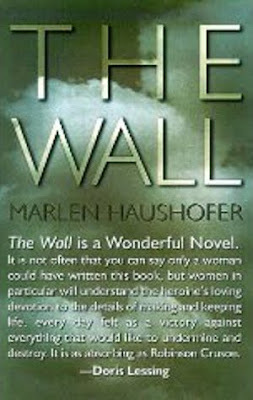 For that purpose, I have found nothing so satisfying as The Wall, Austrian author Marlen Haushofer’s splendid 1962 novel (English translation published in the U.S. by Cleis Press, 1990). The unnamed protagonist awakes one morning to find the entire mountainside where she is staying encircled by an invisible wall. Judging by indicators such as the lack of any aircraft, she surmises that the world has been silently destroyed and she is the only survivor. Rather than fighting off enemy legions, she struggles with feelings of futility, a toothache, planting and harvesting, and the responsibility she feels towards the animals that have fallen into her care. A beguiling incident of violence recounted at the end of the book is what prompts her to begin writing a report of her 2½ years (and counting) within the confines of the wall. Reading is always a solitary act, even more so in a book with only one human character. I took refuge in the story’s rustic setting and in the company of this, the last woman alive, speaking in a voice that quietly commands recognition. The narrator hopes against hope that someone will read her report: “[M]y heart beats faster when I imagine human eyes resting on these lines, and human hands turning the pages.” I felt as if I were the lucky someone who happened upon this account, on the shelf somewhere in an Alpine lodge. The sole survivor of the old world communicating directly with me, the first occupant of the new world that I—alone at last—was given to glimpse in the book’s pages.